Armyworm larva feeds on almost all agricultural crops. The larvae can eat the entire leaves of field crops and grasses. When feeding, they chew from the leaf edges until only the midrib is left. They feed on various crops and grasses during their migration, and often bare crops of tender leaves after passing through. They travel from field to field in great numbers, hence the name "armyworm". 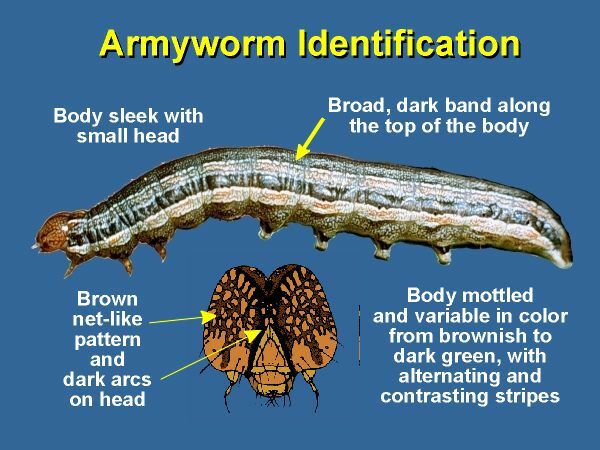 The larvae are described to differentiate the several armyworm species from each other. Mature larvae measure 3.6-4 cm long. They are gray to black in color with alternately bright and pale yellow stripes running longitudinally along their bodies. Black crescent spots are found next to the stripes (IRRI, 2001). Mature larvae measure up to 4 cm long and are generally black, heads faintly mottled with dark brown spots, and with light yellow stripes at their backs. They are characterized by the presence of C-shaped dark spots along their backs (IRRI, 2001). Mature larvae are 3.8-4 cm long and have shades of green, gray, or brown with dark dull dorsal and subdorsal longitudinal stripes. Two rows of C-shaped black spots are distinct along the backs (Reissig; et. al., 1986: pp. 99-109). Mature larvae are 3-4 cm long and are green to pink in color, with longitudinal light grey to black stripes running along the entire length of their bodies. They have brown to orange heads with an A-marking (Reissig; et. al., 1986: p. 102). Mature larvae are about 4 cm long and black in color with yellow or orange stripes along their sides. These are bordered below by a white-stripe on each side. They have an inverted-white-Y on the front of the heads (IRRI, 2001). The full grown larva is 3-4 cm long with two orange stripes on each side. Above and below the spiracles, there is a pale- orange and white-bordered stripe. Less distinctive brown stripes are found on the body (CABI, 2000). Beet army worm (S. exigua). The larvae are 3-4 cm long, green in color with many light stripes along the backs and a broader stripe down the sides. The undersides are usually yellow color (Ellis; Bradley, 1996: pp. 270-271.10). Eggs of armyworms are white and are found in clusters. One egg mass contains 200-300 eggs. These turn yellowish when mature. Hatching occurs in about 2-5 days. The larva varies its colors according to the species. Sizes vary from 2-4.5 cm long. The larva has 6 small legs just behind the head and 10 fleshy legs at the rear. The larva eats voraciously as it grows. It digs 3-6 cm below the soil surface to pupate. The pupa is brownish red in color and about 2-3 cm long. Pupation takes about 7-16 days depending on the climatic conditions. The moth has 3- 4 cm wingspan and 1.5 cm long. Colors vary from light green, light pink, tan, to dark brown in color. The tiny white dot in the center of each forewing is an important feature to identify the armyworm moth. The moth is seldom seen because it is active only at night time, either mating or searching for suitable egg-laying sites. The female moths lay eggs on the lower leaves of growing grasses or small grains.